Finding a putter grip that works for you can often come down to personal preference, but it’s known that different putter grip styles and sizes can help to improve certain aspects of your putting. That’s why we created this post to help you to understand what a thick putter grip does, as well as the pros and cons of a thick putter grip. 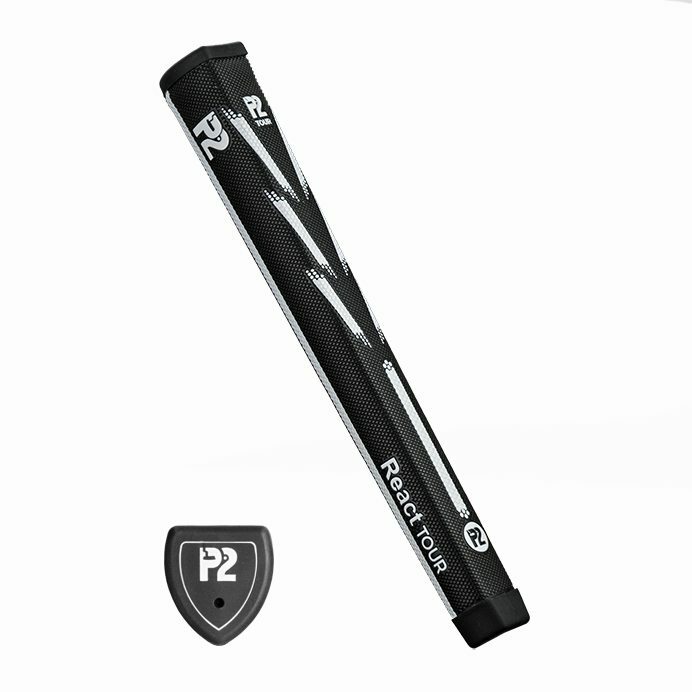 This means you can make an informed choice as to whether this is the best putter grip for you. So what does a thick putter grip do? A thick putter grip can help you improve your putting by allowing you greater control of your putter, limit wrist movement reducing the amount you manipulate the putter face angle as you come into contact with the ball, leading to better accuracy. According to the the USGA Equipment rules, a putter grip can have a maximum thickness of 1.75 inches and a minimum of 7 inches long. It must also be uniform in shape, meaning it can’t be molded to fit the contours of your fingers and hands. Golfers sometimes find it hard to prevent movement in their wrists during their putting stroke. A thick putter grip has a wider area for your hands to wrap around helping encourage a smooth pendulum swing and helping you control the face of the putter better. A Thick grip does this by preventing your wrists from hinging during your putting stroke which can be caused by using a putter grip that is too small. The advantages of a thick putter grip can often help golfers alleviate some common problems that they might have when it comes to there putting stroke. Some advantages fall into the following categories but ultimately are down to personal preference. A thick putter grip can help steady your hands, having a larger diameter giving your hands more surface area to hold so you can relax your hand and arm muscles ensuring your stroke is more consistent. A thick putter grip can help if your grip pressure is too tight. A thick putter grip can often help reduce movement and twisting in the hands, fingers and wrists. This will give you the added benefit of increasing stroke consistency and reducing the potential of missed putts and strokes. A thick putter grip can help correct a swing issue that you may have. For example, a thick grip can help align the hips and the body allowing the torso to be more dominant during your putting stroke. A thick putter grip can help with putting accuracy. A thick putter grip can help lessen this wrist impact through the stroke and enable a better, more consistent roll on the ball. It can also encourage the bigger arm muscles to dominate, reducing the impact of twitchy wrists. The flat surface on the front of a thick putter grip is often wider so your thumbs have a better feel for the line up with your target line, helping your ball alignment. The disadvantages of a thick putter grip can often fall into the below categories, but ultimately are down to personal preference. A thick putter grip can sometimes feel different in your hands depending on the size of your hands. This might take some time to get used to and might mean you have to change your putting style. A thick putter grip is often heavier than a standard size putter grip. Due to the increase in the weight of a putter grip this can make the putter head feel lighter, making your putter feel different and require adjustments in your stroke to get used to changes in your putting distance. A thick putter grip can limit the movement of small muscles in your hands and wrists often benefiting higher handicap golfers. But some golfers prefer feeling the small muscles and place more importance on being able to activate these when putting and judge distance and power in their putting stroke. Just like choosing a putter grip the best way to grip a putter is the way that feels most comfortable and in control for you when you practice and play. The most standard and conventional is the traditional grip. The left hand is wrapped around the top of the grip with the right hand being the lowest on the grip. This grip is often the most comfortable and controlled grip style. Place the left hand on the bottom of the putter grip and their right hand on the top. When this is done, your shoulders feel more level to the ground, allowing for a better pendulum stroke. This grip helps avoid wrist break during the putt. For an overview of how to grip your putter check out our extensive guide on how to grip your putter here. The secret to good putting is to keep your wrists steady, that’s why we invented our grips to help you do just that. Below are the best thick putter grips to help you putt better and an outline of why they could be right for you. The Reflex tour is a thick grip. The sides of this grip are rounded in profile featuring a minimal taper from top to bottom reducing tension throughout the hands and arms. The grip features our patented off-centre shaft technology which provides an unrivaled ability to keep you writs locked. The face of this grip has a wide flat section which allows both thumbs to sit comfortably. The React Tour is a thick grip. The sides of this grip are quite rounded but are smaller than the sides of the P2 Reflex. The putter grip features a minimal taper from top to bottom reducing tension throughout the arms and hands. The grip features our patented off-centre shaft technology giving you an unrivaled ability to keep you writs locked. The face of the grip has a wide flat section allowing both thumbs to sit comfortably. So if you’re beginning to think your putter isn’t working for you anymore and it could be time to trade it in for a newer model, there is a more cost-effective option. It could be time to swap your standard size or midsize putter grip with a thick putting grip or try a thick putter grip that focuses on improving your putting performance. This is a much more cost-effective option instead. Don’t hesitate to contact us if you need any more information on what putter grip might be best for you.